"Dear Leigh, to paraphrase A.E. Housman a bit, 'Terence, this is splendid stuff.' You don't have to be a history buff -- which I am -- to enjoy the smooth flow and fascinating tidbits you've come up with . . . . And just so you know I'm not stretching any truths, I am known as a cold-hearted S.O.B. when it comes to literary stuff. Which is why I loathe anything having to do with that sappy crap . . . ."
-- Unsolicited testimonial for this Web site from William Childress, retired columnist of the St. Louis Post-Dispatch, author of three books, 30+ stories, 200+ published poems, and freelance writer (from email correspondence, March, 2003). He was nominated for the Pulitzer Prize in 1985 and 1986 (dust jacket of Out of the Ozarks). "A marvelous job--well written, thoughtful, telling. I will be re-reading and re-reading it. Other towns should be so lucky. Very impressive!" -- Unsolicited testimonial from Curt Johnson, friend and colleague of Lincolnite Author Robert Wilson (LCHS Class of 1946), editor and publisher of December magazine and December Press since 1962, novelist (Song for Three Voices), nonfiction writer (Wicked City Chicago), and editor of milestone literary publications, including Green Isle in the Sea: An Informal History of the Alternative Press, 1960-85 (from letters to Leigh Henson, November and December, 2003). Many of the Web pages that compose this site are like book chapters and include textual and end citations (Sources Cited). Overall this book-length Web site has used approximately 130 printed sources and many Web sites. 2. About Henry Ford and the Postville Courthouse, the Story of the Postville Courthouse Replica, Tantivy, & the Postville Park Neighborhood in the Route 66 Era. also the founding of Lincoln College, the plot to steal Lincoln's body, and memories of Lincoln College and the Rustic Tavern-Inn. The Bicentennial Commission of Lincoln, Illinois. 7. The Living Railroad Heritage of Lincoln, Illinois: on Track as a Symbol of the "Usable Past"
14. Sightseeing, Shopping, and Dining in the Logan County Courthouse Square Historic District, Including Locations of Historical Markers. This entire historic district is on the National Register of Historic Places. Note: Some of the Web pages below were created by past and present Lincolnites who are interested in fostering Internet communication among other native sons and daughters (many of them scattered throughout the nation, some even the world). To advance this communication, I have created additional pages in this section to present memoir and creative writing of other native Lincolnites. Some of their writing was done specifically for this Web site, and other writing was done independently of this project but has been republished here with each writer's permission. Place cursor on article above, right click, and hit "open link in new window" to access a larger, readable version without losing the main site map page. See below for article's conclusion. No matter where Leigh Henson resides, his boyhood home of Lincoln is only a mouse click away. 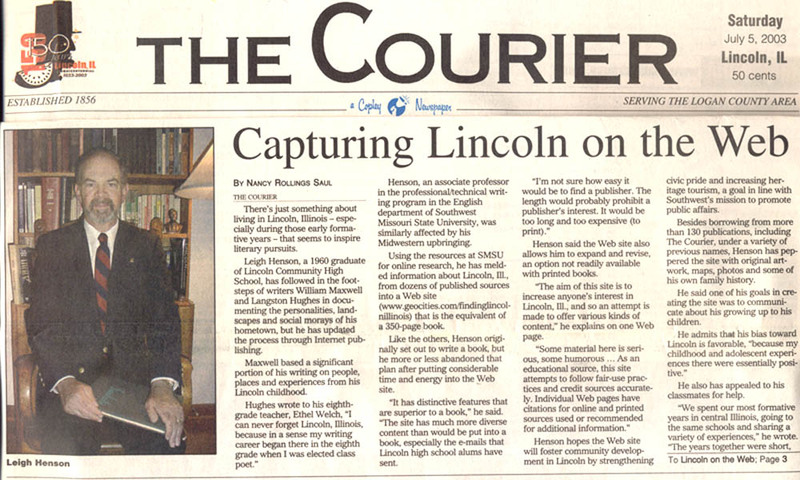 Last July the 61-year-old former Pekin Community High School English teacher, who's now a professor of technical writing at Southwest Missouri State University, launched his Web site (www.geocities.com/findinglincolnillinois/), which tells the story of President Abraham Lincoln and the first town named in his honor. In Lincoln, the country's 16th president had practiced law, substituted as a judge, owned property and engaged in politics. 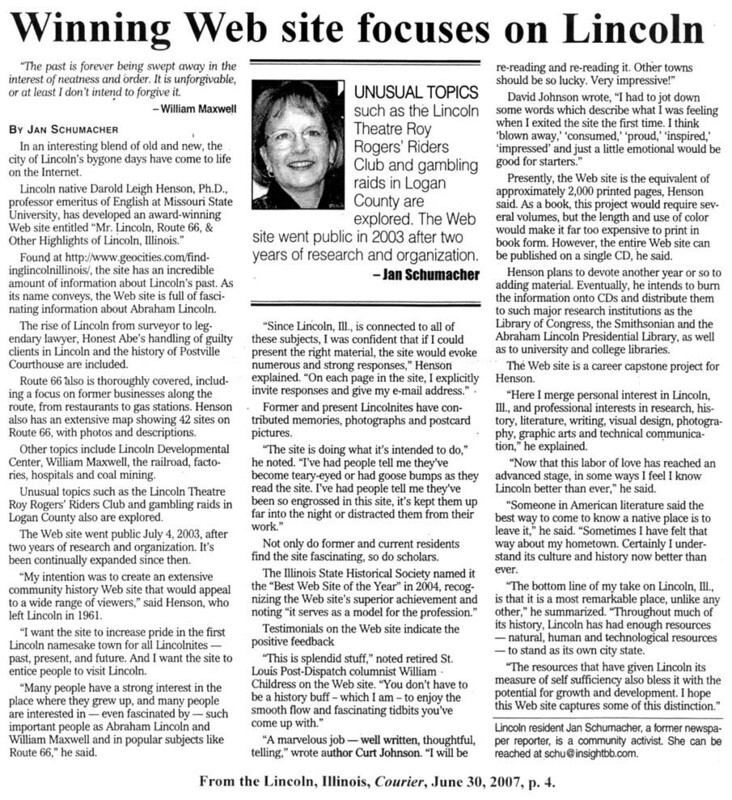 In Henson's introduction, he writes that he created this Web site as a public service to educated viewers about the rich heritage and promising future of Lincoln--a community of 15,400 located 60 miles south of Peoria. 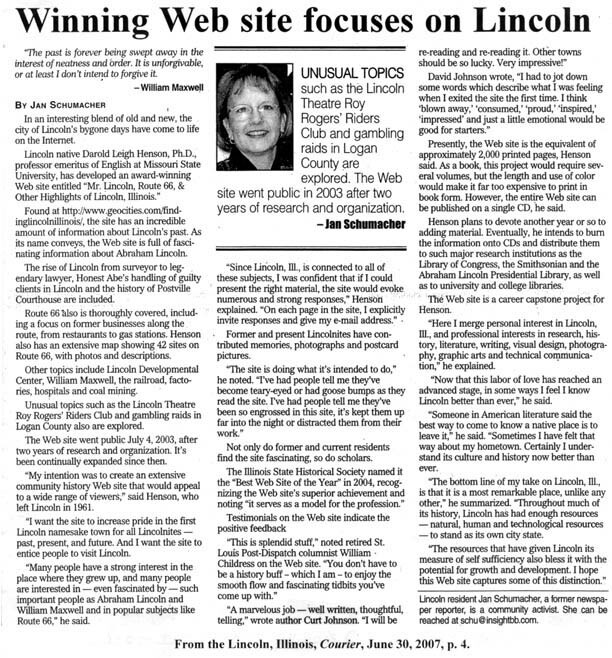 He hopes the Lincoln Web site will promote civic pride among the town's residents and encourage nonresidents to visit his boyhood hometown. Henson is following in the footsteps of former Lincoln resident and literary figure William Maxwell, who often focused on the small Midwestern community in his novels and short stories. But rather than deliver his message in print, Henson chose the Internet. "I teach a graduate course in Web site design and development," Henson said in a telephone interview. "So this was good practice for me. Developing a Web site publication has distinctive advantages over traditional book publication. With a Web site, you can interact with the reader. A Web site also allows you to add and revise the content a lot easier. "My Lincoln Web site home page [now the Introduction] carries announcements of new additions. For example, in the chapter "The Transformation of Abraham Lincoln and the Founding of Lincoln, Illinois," I recently added a 4,000-word section about two lawyers, Samuel Parks and Lionel Lacey, with whom Abraham Lincoln collaborated while practicing law at the Logan County Courthouse from 1853 to 1860. "Parks became a distinguished judge and was a key supporter of Abraham Lincoln in the 1860 Republican Convention that nominated Lincoln as its presidential candidate. I published rare photos of these attorneys in the Lincoln Web site." Henson's Web site is the equivalent of more than 800 printed pages with about 1,000 images . Some 7,000 viewers have visited the site. It also has attracted the notice of the Illinois State Historical Society, which recently named the site "best Web site of the year." "The Illinois State Historical Society has two levels of awards," Henson said. "The top level is Superior Achievement, which is the one my Web site won. Naturally, I'm very pleased with the award. It means recognition for several years of research on this project. And by winning the award, I got some publicity, which will mean more people will know about the Web site." 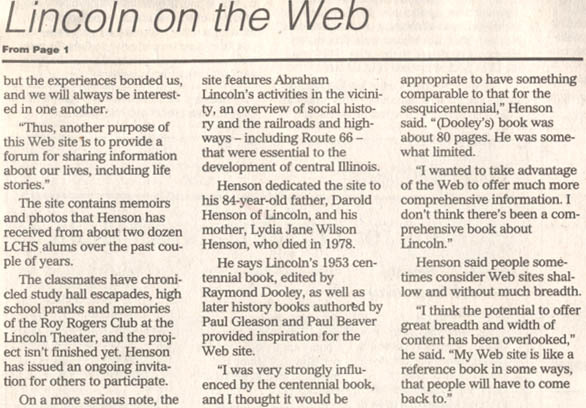 Included in the Web site's content are Henson's memoirs of growing up in Lincoln as well as recollections of present and former Lincolnites. "Where I lived was within walking distance of the Postville Courthouse, where Lincoln practiced law riding the 8th Judicial Circuit," Henson said. "I also lived very close to Postville Park, where Lincoln played an early form of baseball. I remember many family picnics in that park. I grew up with both sets of my grandparents within walking distance of my home." In creating the Web site, Henson had the help of many native Lincolnites, including attorney Fred Blanford and Illinois Appellate Court Justice James Knecht of Bloomington. "In addition to recollections about growing up in Lincoln from Justice Knecht, I also included a short story by him about playing pool at Hickey's Billiards in downtown Lincoln on Chicago Street. Knecht's story tells how this pool hall was a real-world classroom that taught him a great deal about human nature. The story is as good as any Hemingway short story." In addition to writer William Maxwell, poet Langston Hughes also called Lincoln home for a time. "Hughes spent his eighth-grade year in Lincoln," Henson said. "In 1953, he wrote his eighth-grade teacher, Miss Ethel F. Welch, that he had never forgotten Lincoln. He told her that his writing career began in eighth grade when he was elected class poet." Among many published sources used to develop the site are quotations from Maxwell, who used people and places from Lincoln in many of his short stories. The Web site goes into great detail on the founding of Lincoln on August 1853. The town was located about a mile east of a community called Postville in the vicinity of the Chicago and Alton Railroad tracks. Postville would later be absorbed by the town of Lincoln. According to the Web site, the town's developers proudly asked their distinguished attorney, Abraham Lincoln (also the railroad's attorney), if he would agree to have the town named after him. Lincoln reluctantly agreed. But in Judge Lawrence Stringer's account in a history about Logan County, Lincoln cautioned the developers, "You'd better not do that, for a I never knew anything named Lincoln that amounted to much." The town, which eventually became the county seat of Logan County, was named for Abraham Lincoln long before he became a nationally known figure. Lincoln christened the town with juice from a watermelon. Henson's site also delves into the social and economic history of that community. There are extensive sections on local businesses and the influence of the railroad. There also is a section on Route 66, the historic highway that ran through Lincoln. The town is rich in remnants of what Henson calls "the world's most famous highway." "Both sets of my grandparents lived on Route 66," he said. "One set of grandparents owned a grocery store and a gas station right on Business 66. That highway was a good part of my youth." Henson also writes of such Prohibition-era figures as bootlegger Coonhound Johnny and of famous roadhouses like the Maple Club. A 1960 graduate of Lincoln Community High School, Henson earned his bachelor's (1964), master's (1969), and doctoral (1982) degrees in English from Illinois State University. He taught English at Pekin Community High School for 30 year before going to Southwest Missouri State University in 1994. Henson has two grown children, Kendra Henson, 31, and Brandon Henson, 27. Five years ago, he married Pat Hartman, who years earlier was a student in one of Henson's English classes at Pekin Community High School. Henson began his Web site as a way to learn more about his hometown and to show others what it's like growing up in a small town. He spent several years collecting photos, maps, and vintage postcards and doing research for the project. "It took two or three years and a lot of trial and error with computer technology to develop the Web site, he said. "A lot of people see Web sites as superficial. That doesn't have to be. I believe my Web site is significant in its content and purpose. I'm trying to educate readers about Lincoln as well as promote civic pride and increase heritage tourism. "I feel as technology advances, we will see more Web sites with substantial content used in education."